Harmsco® SureSafe™ cartridges are fabricated with the latest in Silver Zeolite technology and provide antimicrobial protection on the cartridge, outlasting the competition. Micron Ratings: Nominal micron ratings of 20 and 50. 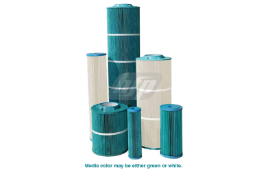 Filter Media: Antimicrobial media with Silver Zeolite fibers. Center Tubes: ABS or PVC. Shrink Wrap: Standard for all antimicrobial cartridges.